An exquisite blend of silk and cotton, woven in Italy in a lightweight boutis jacquard. The luxury of silk combined with the livability of cotton allows this elegant cover to provide an added layer of warmth while remaining luxuriously soft to the touch. 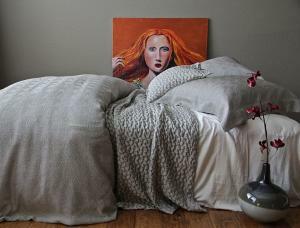 Shown on bed in Caviar duvet and shams, with Pouf Caviar cover, Ella Caviar and Lena Stucco sheets. Available in several colors including, Parchment, Steel, and Caviar. All SDH products with the exception of bedskirts, coverlets and matte lasse products are machine wash warm and tumble dry low. We urge you to wash your linens separately from other items. Zippers, buttons, and other rough surfaces may damage the long staple fabrics causing pilling. We recommend the SDH Fine Fabric Wash or other mild laundering products to safeguard your investment. We also strongly recommend that whatever detergent you choose, it not have any brighteners or other bleaching agents as this will eventually fade colors and inherently weaken the fibers. We do not recommend fabric softener. Remove your load promptly from the washer, shake the items and line dry or place in dryer when advisable. All SDH BEDSKIRTS, COVERLETS AND MATTE LASSE should be dry cleaned or machine wash cold and block or line dry. These items are NOT sized for shrinkage. Items requiring special order will be processed and shipped directly to you as available. Since SDH is manufactured in Italy on the finest Italian looms, ordered items may take up to 6 weeks to arrive, but we promise it's worth the wait! Should your item require ordering we will alert you with an updated ETA.